Home / Other Political News, Politics / Here is what RUTO said about the motion of impeachment planned by NASA’s ORENGO against him - The hustler from Sugoi has panicked! Here is what RUTO said about the motion of impeachment planned by NASA’s ORENGO against him - The hustler from Sugoi has panicked! Tuesday March 26, 2019 - Deputy President William Ruto has finally spoken about the looming impeachment motion being pushed by Siaya Senator James Orengo. Over the weekend, Orengo revealed plans to have Ruto impeached over gross misconduct, a move that has elicited a sharp debate across the political divide. “The threshold for the removal of Deputy President on constitutional grounds is much lower than going through a criminal trial or prosecution,” Orengo said. 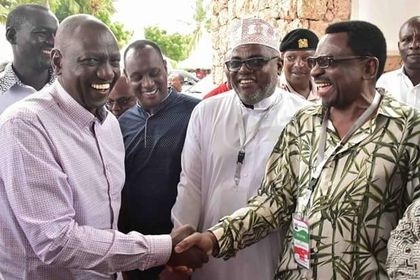 But Ruto through his Communication Adviser, Emmanuel Talam, said Orengo is plotting to deputise President Uhuru Kenyatta for the remaining term should the impeachment be successful. "Am keen to know ODM's replacement for DP Ruto when they finally impeach him as planned. Am sure Orengo is a candidate @HonAdenDuale @kipmurkomen @OleItumbi," Talam said on Monday. For Ruto to be impeached, two-thirds of MPs must back such a motion in Parliament. The President has powers to appoint another person as his principal deputy in such a scenario. Impeachment of Deputy President William Ruto will not go successfu since he also have a number of Mps who will oppose the motion.